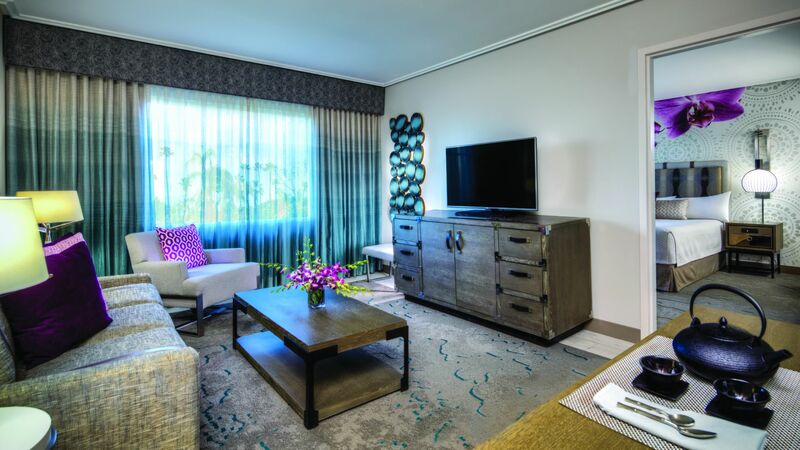 Our gorgeous suites range in size from 670 square feet to a sprawling 2,010 square feet, and have all have the right ingredients to make your stay refreshing and relaxing, whether you opt for the Jurassic Park Kids' Suite or the Captain's Presidential Suite. The fact is, not all Orlando resorts are created equal. But with ample space and so many extras, the guestrooms here at Loews Royal Pacific Resort are also a surprisingly good value. Plus, our location on the grounds of Universal Orlando™ makes getting around a breeze. At 670 square feet, you’ll feel like island royalty in the King Suite featuring a living room and separate bedroom with a king-size bed. The spacious living area offers ample room for your relaxation and entertainment, along with a pull-out sofa and a desk area. Both rooms feature an entertainment center with television and sitting areas. Mom and dad can have a little privacy with a king bedroom for two adults, while the kids can have some fun in their own attached themed room where they can climb into two twin beds modeled into personal gyrospheres. The kids’ room only opens into the adults’ room, connected via a door modeled after the dinosaur enclosure that can be opened or closed to contain your little wild things. Sleeps up to 5 (1 king bed and two twin beds) with rollaway*.